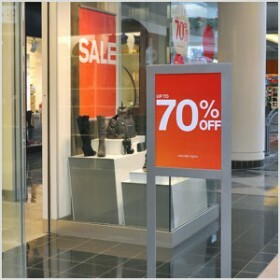 POP signage comes in many shapes and sizes that can influence and inform customers. Whether you are in the market for display signage, shelf talkers, aisle talkers, hanging signage or custom displays, we can provide you with solutions that will create interest. Our unique in-house signage options will allow you to promote your business, cost effectively. At GVC we are introducing innovative solutions for the POP market. Innovations like ceiling hanging signs that are budget friendly and customizable. Attract your customers’ attention with colour floor graphics. These graphics are produced with slip resistant laminates and offer aggressive surface adhesion, while still being easy to remove, when the time comes. Floor graphics can be used in retail environments and are also very popular for tradeshow booths. The adhesive will stick to both hard flooring surfaces and carpet. Why limit yourself to vertical surfaces – when you can create excitement with the floor.